Lemon Essential Oil is extracted from the rinds of lemon, which lends its fresh citrus fragrance. This cold-pressed oil has a strong bright scent that is both refreshing and uplifting. Its astringent and purifying properties also make it a great aid to help cleanse and tone the skin, while delivering a boost of Vitamin C antioxidant benefits. Peppermint Essential Oil is a multi-purpose oil that cools, energizes and refreshes the body and mind. This steam-distilled oil is extracted from dried or fresh leaves from the Mentha Piperita herb, giving it a sharp, menthol fragrance. Its pleasantly sweet and minty aroma makes it a premium choice for aromatherapy to improve the mind and lift the spirits. Lavender Essential Oil is a steam-distilled oil that relaxes and rejuvenates the body and mind with a fresh floral aroma. This essential oil is extracted from the oil glands of the Lavandula Officinalis plant, which gives the oil its sweet herbaceous fragrance. Our Lavender Essential Oil’s clean and serene aroma makes it a perfect companion for aromatherapy to help ease the mind. 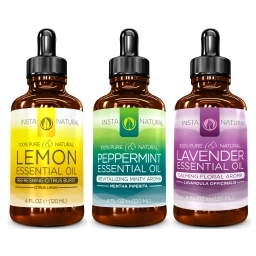 Ingredient: 100% Pure Steam-Distilled Lavender Essential Oil (Lavandula Officinalis)"
The peppermint oil is the one that I received and it's amazing! Aside from the description posted above provided by the company, you know what else peppermint oil is good for? It's an all natural deterrent for mice and spiders! Yup, that's right! My neighbor told me about it once when I told her I was having an issue with spiders. She said to put a little bit around the window sills and I would see a big difference, she was right! So, whether you are using if for yourself or for a home remedy like I suggested, it's a great product with many wonderful benefits.